2. A cluster of bananas is known as a hand, each banana are fingers. 3. Rubbing the inside of a banana peel on bug bites are said to relieve itching and inflammation. 4. Over 95% of American households purchase banana at least once a month. 5. Bananas are one of the only fruits harvested every day of the year. They do not grow in regions that have dramatic seasonal changes. 1931 RIP Helen Porter Mitchel, her stage name, Nellie Melba was a world famous operatic soprano born in Australia. Melba Toast and Peach Melba were named for her. 1944 Leo Hendrik Baekeland was born. He was a chemist who invented Bakelite, the first plastic that did not soften when heated. Those black plastic knobs on stoves were made of bakelite. 1997 Scientists in Scotland announced the first successful cloning of an adult mammal, Dolly, a sheep. A hand of bananas with fingers and a giant herb… what fun and fascinating facts, plus I adore bananas in all kind of concoctions or alone. Looks yummiii, i will make it ;-). I LOVE the quote! I totally am going to try it on the banana-on-a-bug-bite thing since I’m severely allergic. Oh and I go through a hand of bananas a week! Next time I get a bug bite, I am trying the banana peel trick! 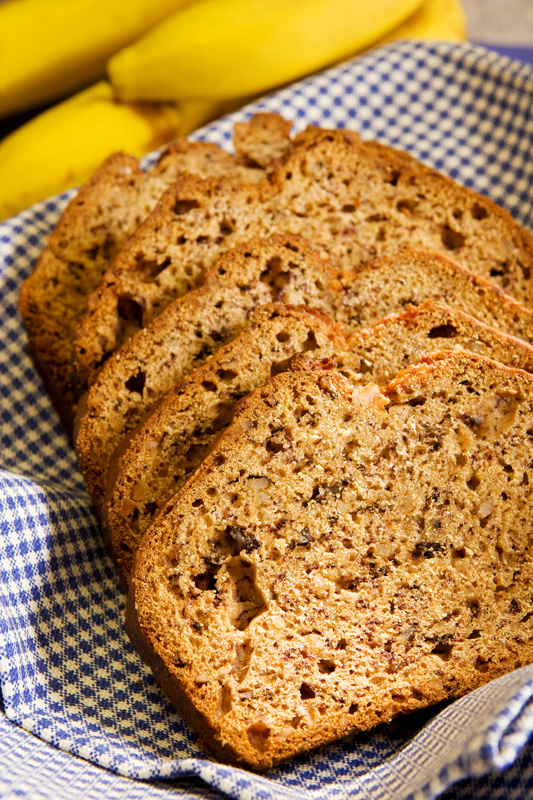 Mmm…banana bread..my favorite! Thanks for the food facts. I’ll have to try tip #3. Anyone ever peel a banana and have it already sliced? There’s a neat trick to do it with thread. A day dedicated to one of the best breads! AWESOME! Was in the stars at our house, too. Made a variation on my usual banana bread yesterday, and the kids demolished it this morning at breakfast. Great when all the stars align! Using a banana peel to relieve a bug bite! Will try especially living in south fl. Giant herb? Not a tree?? nonetheless, I’m hungry for Banana bread now. Just wanted to let you know that I’ve given you the ABC Award. Please visit my website if you’d like to join in the fun! http://www.susartandfood.wordpress.com. Have a great day! Oh… I love banana bread! The photo is incrdible and I loved all the information all of which was new news to me, think I will have a finger… banana! My mother used to make banana bread as a cake for my birthday, with whipped cream frosting between the layers. I cannot find the recipe! Some secrets should not go with you to the grave. I have to have walnuts in my banana bread. I buy my bananas green so they ripen at home. When I buy those yellow bananas they spoil too fast. I let a few ripen just to make banana bread. I am new to your blog. I really like the way you have it set up!!! It is easy to read and fascinating. Thanks. Has to be my favorite day!!! Now I know why I woke up craving bananas! (: Mmm. I was just thinking about banana bread yesterday. Yes, we have no bananas, no bananas today. Will definitely have to get some so I can make some bread. Crazy – I just posted about banana bread yesterday!! Bananas (and bread) are definitely a favorite snack of mine. Gotta love a fruit that’s in-season year-round! The funny thing is that in my country, where bananas do not grow and back Soviet times, you could not really get them, banana pie or bread recipe still was used. Only instead of bananas, we added grated carrots or pumpkin to it. What? A banana tree isn’t a tree, but a herb? I feel I’ve been duped all this time. Really?! Awesome. Yesterday I sneaked two bananas away from my brother’s watchful eyes (he’s a devoted slave to the fruit) because I wanted to make banana bread. Now, I’m thinking it was all in the stars!